A 3-1 home victory over Warrenpoint on Tuesday took the Glens into eighth place in the table, one point behind Institute and one in front of Dungannon Swifts. Glentoran's target to reach the play-offs is seventh though even if The Oval outfit finish in that position there are doubts about whether they would be eligible to play in Europe next season. They are set to apply for a European licence but with Smyth not having a Pro Licence, that is a sticking point. Kieran Harding, who is on the Glentoran coaching staff, has the qualifications. Another factor in the Glentoran mix is the expected incoming investment from an Iranian businessman. 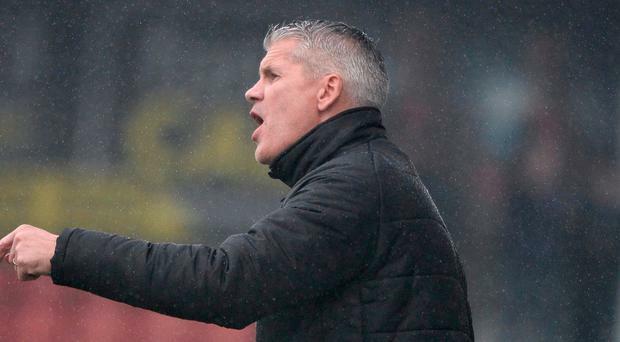 Belfast native Mick McDermott, who has operated as fitness coach to Carlos Queiroz with Iran and is now with Colombia, is believed to be a key figure in the deal and has attended matches at The Oval recently. Since taking up the reins following Ronnie McFall's departure last month, there have been ups and downs for Smyth who is determined to finish the campaign on a high. "Our target is to finish seventh," said Smyth. "If we can get into the European play-offs we might surprise a few teams above us. "I feel in a one off play-off match and at our best we would be capable of beating any of them, though we have to finish seventh to have a chance of that which means finishing ahead of Dungannon and Institute, who are both playing well. "For us, there is still a lot to play for this season."